Jude Joseph, an eloquent speaker with his very vivid and informative presentation with facts and figures well researched, had the participants wanting to know more and more as to how the rainbow could find its colours at the Members Speak held at Galadari Hotel on 24 January 2019. 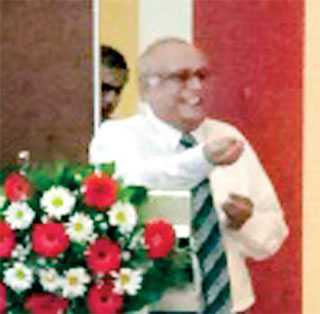 He commenced by stating that even 10 years after the end of the 30-year-long civil war, Jaffna – Northern Province, is still struggling to regain its foothold of its past glory, both socially and economically. In 1981 the contribution of goods and services from the region was 30% to the GDP of Sri Lanka. Now it’s only a meek 3.3% to the GDP (Central Bank 2017). The region has mainly become a consuming economy. All old large and medium scale industries are destroyed and some of the buildings which housed them are standing as monuments of the past glory! However, both the Government and the private sector are making valiant efforts to uplift the economy and the society. The Government, in its effort, has expended a significant amount of resources and funding on infrastructure, especially on road network and housing. Further, the Government has also given significant concessions for investment projects by the private sector. Unfortunately, the expected private sector investors are just trickling-in to make use of the opportunity. NGOs have also played a crucial role in providing back to back grants to southern corporates who have come up with sustainable employment generation projects. Great untapped potential still lies in the agriculture and fisheries sector which need to be harnessed in coming years. Coconut and cashew plantations are in the process of being revived and forward integration for value addition is much desired. The country is looking bright and enjoying an upward trend in the tourism sector and much is desired from both state and private sector to channel some investments towards the north. Jude educated the participants that a comprehensive five-year district development plan 2018 – 2020, titled ‘Sustainable Development of Jaffna District’ is already in place at the GA’s office in Jaffna and also available in PDF format for those who are interested to play a role in the development journey.